If your ideas about meal preparation during camping trips extend beyond making the best possible use of built-in campsite grills or open fires, you're likely to find the idea of adding outdoor cooking systems to your inventory of camping supplies to be quite appealing. To many camping enthusiasts, the best part of travel is having an opportunity to prepare and enjoy meals in the relaxed environment of the great outdoors. While some campers think that the perfect campground meals involve sticks, marshmallows, hot dogs, and an open fire, many others prefer a more sophisticated approach to outdoor meal preparation. If you're the type of camper who is always looking for better ways to prepare outdoor meals, you're probably more interested in cooking systems than in exploring the best techniques for simple open fire cooking. While many of the complete outdoor cooking systems on the market are designed for individuals seeking to create an outdoor kitchen in their backyards, there are also a number of options designed with the limited space concerns and transportation needs of campers in mind. Camp Chef's modular cooking system is an ideal option for campers seeking an easily portable and flexible solution to cooking in the outdoors. This versatile outdoor stove can accommodate all types of food preparation techniques, including boiling, frying, smoking, grilling, roasting, and more. It can easily be used during camping trips, for tailgating outings, as well as for at backyard cooking needs. The Bayou Classic outdoor cooker is one of the best options for campers, tailgaters, and outdoor cooking enthusiasts. The unit includes a large stockpot perfect for frying a turkey, boiling crawfish, or stirring up a large batch of chili or stew or chili. If you spend most of your camping time at facilities that provide charcoal grills, this cooker offers a good way to expand your outdoor cooking capabilities. To make the most of outdoor cooking systems, you'll need to have all the tools and accessories necessary to create your favorite recipes. 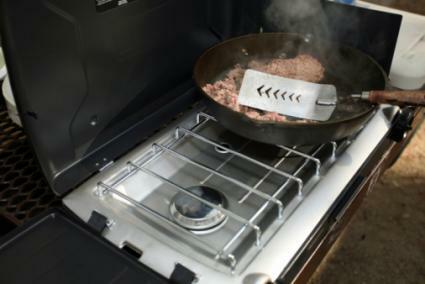 Prior to your next camping trip or cookout, make sure you have a sufficient amount of fuel to use your cooking system. Always check the tank ahead of time. If you'll be traveling or preparing meals for several days in a row, it's a good idea to have a spare container of cooking fuel handy.Whether you use your outdoor cooking equipment at home or when you're camping, you'll need a set of long handled cooking tools. You'll probably need a spatula, a pair of tongs, and a sharp knife, at a minimum. Depending on the type of system you have and the recipes you plan to prepare, you may also need heavy duty pots and pans appropriate for outdoor use. If you want to enjoy hot tea during your camping excursions, be sure to include a kettle in your list of equipment to pack. Pack spices, aluminum foil, non-stick cooking spray, and all the items you'll need to keep your cooking system clean and in good working order.